Living a Fit and Full Life: Get the Perfect Skin You've Always Desired with KORRES! Get the Perfect Skin You've Always Desired with KORRES! Established in 1996 out of Greece's oldest homeopathic pharmacy, KORRES offers advanced natural formulations that deliver maximum results. 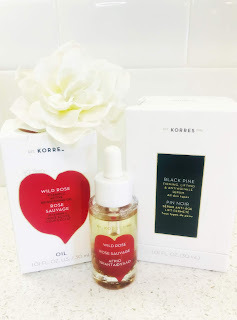 This brightening oil infused with real wild rose petals pays homage to the legendary Wild Rose Oil ingredient that started it all. This ultra concentrated Vitamin C oil is rich in omega 3, 6, 9 fatty acids and vitamins A and C. It provides significant antioxidant action while repairing fine lines and wrinkles and improving skin's overall tone and texture. This silky oil easily absorbs into skin, delivering a fresh, dewy, enviable glow. The new reformulation of this award-winning oil is now synthetic-fragrance free, delivering the same powerful results with an all-natural scent. Ultra concentrated serum with recontouring, firming and lifting action for 3D facial sculpting. Boosted with ElastiLift-3D™ complex and Black pine polyphenols, it helps promote skin elasticity, reduce the appearance of wrinkles and improve facial architecture. All KORRES Black Pine Formulas are boosted with potent Black Pine extract from trees in the Mediterranean that have survived even the ice age. During two years of primary clinical research, the KORRES research Lab in Athens, Greece discovered that powerful Black Pine polyphenols help promote skin elasticity and firmness, visually lift face contour and reduce the appearance of wrinkles. Get perfect skin with KORRES! KORRES is a brand I've fallen head over heals in love with so I was extremely excited to try some more products from them! I had the please of trying the products above and I'm super impressed! 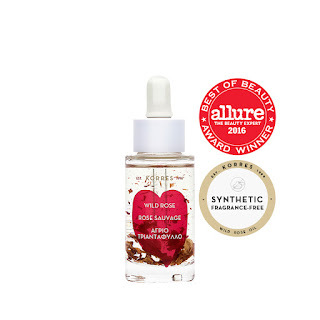 WILD ROSE Vitamin C Active Brightening Oil from KORRES is A-M-A-Z-I-N-G! If your complexion ever starts to look dull and tired, this brightening oil will revive it in seconds. It's an ultra concentrated Vitamin C oil that is rich in omega 3, 6, 9 fatty acids and vitamins A and C. It provides skin significant antioxidant action while repairing fine lines and wrinkles and improving skin's overall tone and texture. It absorbs quickly and leaves skin with a radiant glow in mere seconds. It's a life saved for a dull complexion! 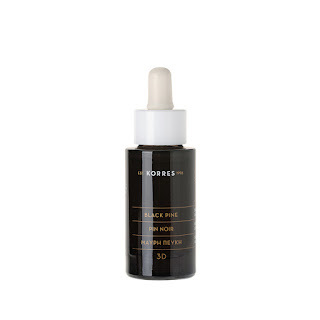 KORRES' BLACK PINE 3D Sculpting, Firming & Lifting Serum is an incredible serum for all skin types! It's an ultra concentrated serum with recontouring, firming and lifting action for 3D facial sculpting that you will love. It's boosted with the amazing ElastiLift-3D™ complex and Black pine polyphenols to help promote skin elasticity, reduce the appearance of wrinkles and improve facial architecture. After just a few uses, my skin feels firmer and my fine lines are softened. This serum is a must have in any beauty routine! KORRES has just what you need to get the perfect skin you've always desired! 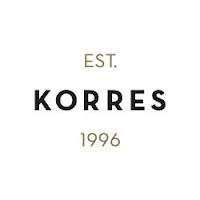 Click HERE to learn more about KORRES! Follow KORRES on social media!